In November, little E had a surgery. Though it was a common operation and straightforward, my stomach was in a knot for the drugs they had to give him to put him under, and the hours of fasting he had to endure before even arriving to the hospital. While a lot was in the hands of the doctors, the mama bear in me had to do something, anything. 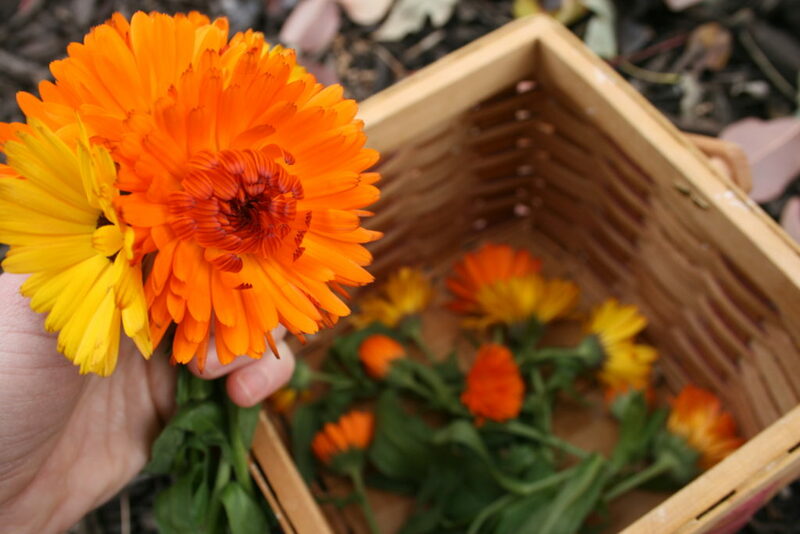 Working with these calendula flowers was calming, grounding and ultimately healing for my boy. If you’re new to working with herbs, starting with a tisane (or tea), is a fantastically easy introduction. Here we simply ground up the flowers, steeped them and used the tea to wash his incision. 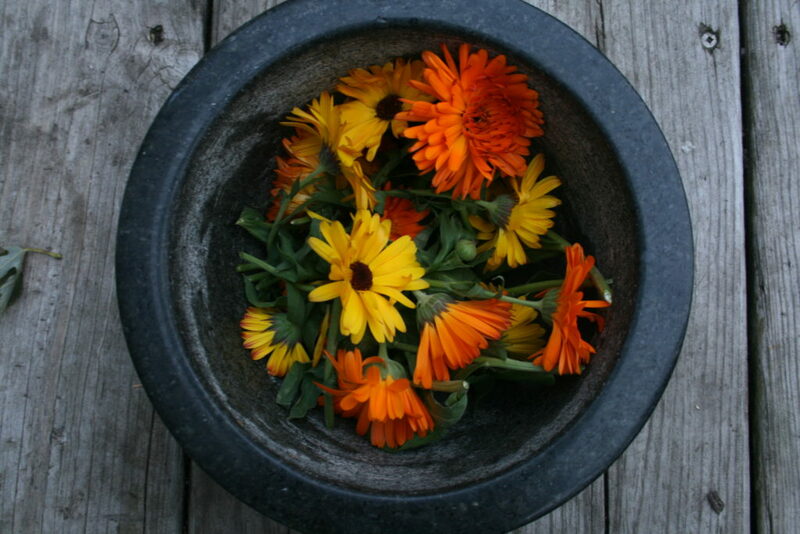 I chose calendula because I had it in the garden and its benefits are numerous, particularly for skin issues. 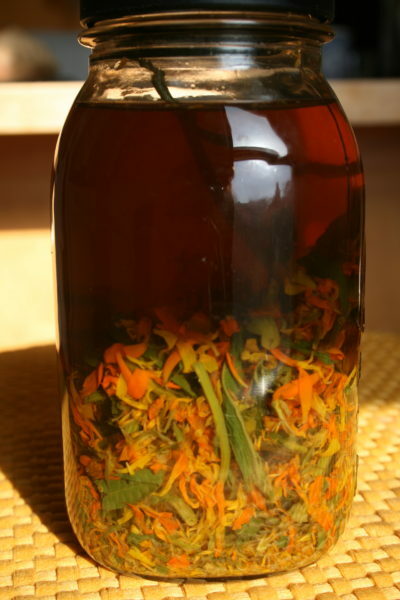 Calendula has anti-inflammatory, antimicrobial, and antibacterial properties. According to what I’ve read, this plant can help to reduce swelling and bruising, as well as to minimize scarring. This all sounded really useful for healing E’s incision site! I am certainly not an encyclopedia of natural healing remedies, but having kids sure does force me to learn more! 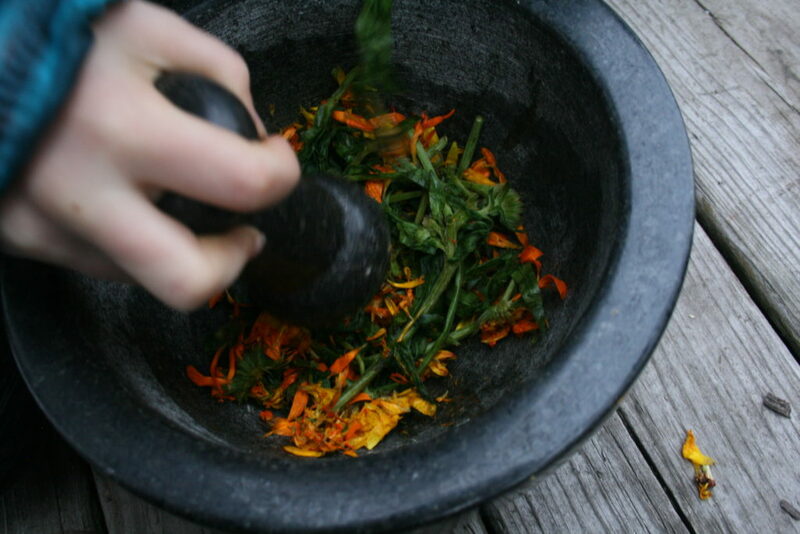 Wanting to incorporate the use of plants and herbs into one’s life for their supportive and healing benefits can be an overwhelming and daunting task if, like me, you didn’t grow up with that type of knowledge. There are countless plants with beneficial properties, each of which have more than one component to them, and there are many different ways to prepare the plant for our use. On top of that, remembering what herb is good for which ailment feels impossible. It is indeed a huge topic! Before I ever even gardened, I somehow came to own an old hardcover copy of The Complete Book of Herbs and Spices. I highly recommend it to anyone wanting to peek at this world of knowledge, and also to those already equipped with some of this knowledge. This book is not a massive, comprehensive reference guide. Instead, it’s a book that can be both a coffee-table flip-through item, or a super informative guide with instructions and recipes. It’s easily digestible and full of inspiring photographs! Have you incorporated any plants or herbs in your family’s life? Please share how!